It's that time of year where much of Pennsylvania will start seeing serious winter weather. 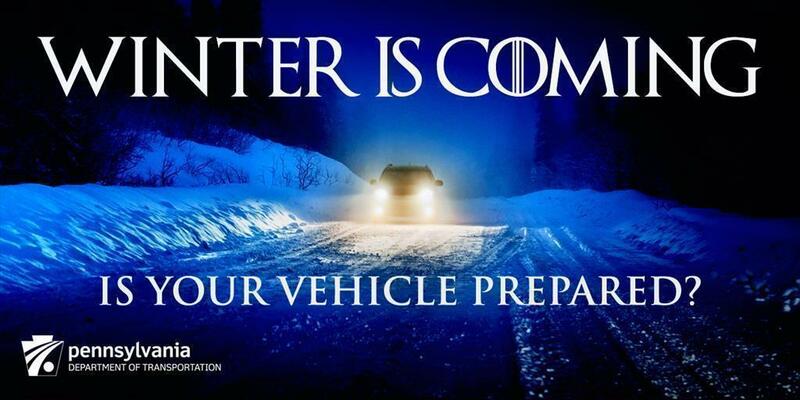 In recognition of Winter Driving Awareness Week, PennDOT encourages motorists to always be prepared for any kind of weather. "Refreshing yourself on winter driving and preparations is just as important in the winter as it is the rest of the year," Richards said. "No matter whether they are taking short or long trips, it is important for drivers to ensure they are prepared for any type of weather and road condition." If you plan to drive in the winter months, please have your vehicles checked by a trusted mechanic. The parts that should be reviewed include the cooling system, battery, hoses, and drive belts. All fluids should be filled, lights are working (both front and rear), wiper blades work smoothly (without streaking), and tires often for the correct level of air pressure. Mechanics know the adequate tire-tread depth to perform on ice and snow. A vehicle emergency kit should be prepared or restocked containing items such as non-perishable food, water, first-aid supplies, warm clothes, a blanket, cellphone charger and a small snow shovel. Motorists should tailor their kits to any specific needs that they or their families have such as baby supplies, extra medication and pet supplies. Motorists should be aware that all vehicles should be fully clear of ice and snow before winter travel, especially on head and tail lights. If snow or ice is dislodged or falls from a moving vehicle and strikes another vehicle or pedestrian causing death or serious bodily injury, the operator of that vehicle could receive a $200 to $1,000 fine. For more information on safe winter travel, an emergency kit checklist and information on PennDOT's winter operations including a video, visit PennDOT.gov/winter. Additional winter driving, and other highway safety information is available at PennDOT.gov/safety. Follow PennDOT's social media accounts — Facebook, Twitter, and Instagram — for the latest winter-weather updates.